Health is a state of physical, mental and social well being. The conditions necessary for good health are :- i) Good physical and social environment. ii) Good economic conditions. iii) Social equality and harmony. Good physical and social environment includes clean surroundings, good sanitation, proper garbage disposal and clean drinking water . Good economic conditions includes job opportunities for all for earning to have nutritious food and to lead a healthy life. Social equality and harmony are necessary for a healthy and peaceful life. 1. It is a state of physical, mental and social well being. It is a state of absence from diseases. 2. It refers to the individual, physical and social environment. It refers only to the individual. 3. The individual has good health. The individual may have good health or poor health. 4 3) What does disease look like ? When a person is affected by a disease either the normal functioning or the appearance of one or more systems of the body changes for the worse. These changes give rise to signs of the disease called symptoms. On the basis of the symptoms the physicians look for the signs of a particular disease and conduct tests to confirm the disease. 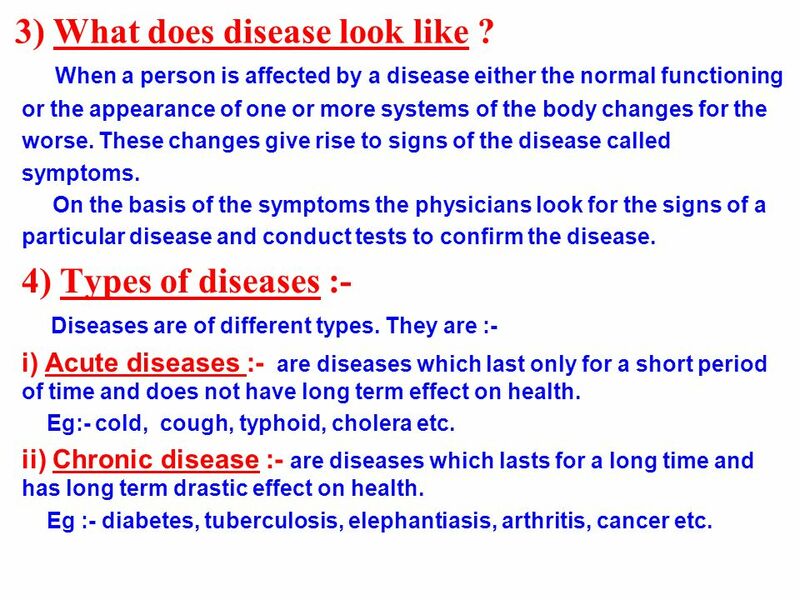 4) Types of diseases :- Diseases are of different types. They are :- i) Acute diseases :- are diseases which last only for a short period of time and does not have long term effect on health. Eg:- cold, cough, typhoid, cholera etc. ii) Chronic disease :- are diseases which lasts for a long time and has long term drastic effect on health. Eg :- diabetes, tuberculosis, elephantiasis, arthritis, cancer etc. 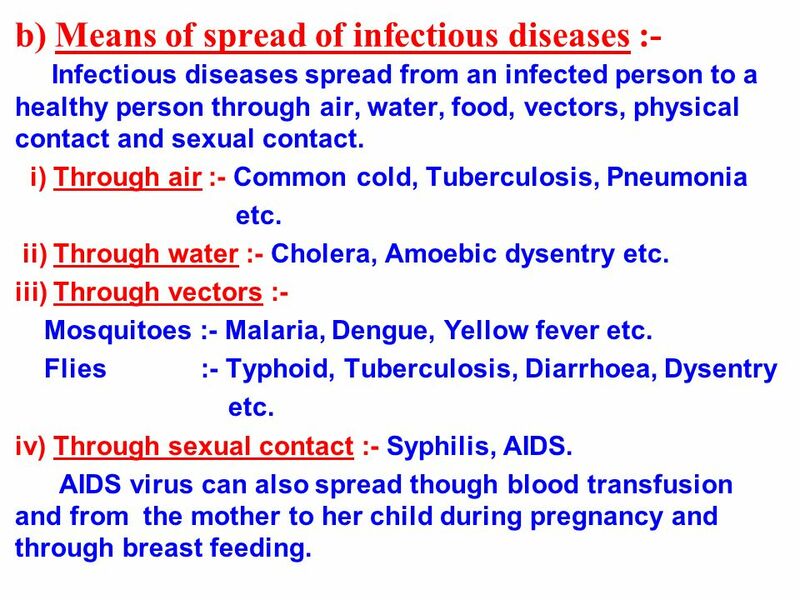 iii) Infectious diseases (Communicable diseases) :- are diseases which spread from an infected person to a healthy person through air, water, food, vectors, physical contact or sexual contact. Eg :- common cold, chicken pox, mumps, measles, typhoid, cholera, tuberculosis, malaria, AIDS etc. 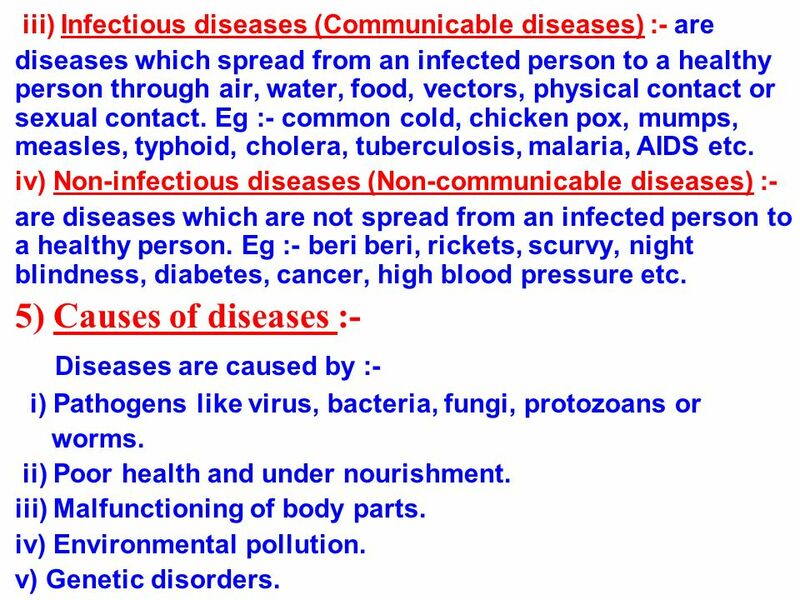 iv) Non-infectious diseases (Non-communicable diseases) :- are diseases which are not spread from an infected person to a healthy person. Eg :- beri beri, rickets, scurvy, night blindness, diabetes, cancer, high blood pressure etc. 5) Causes of diseases :- Diseases are caused by :- i) Pathogens like virus, bacteria, fungi, protozoans or worms. ii) Poor health and under nourishment. iii) Malfunctioning of body parts. iv) Environmental pollution. v) Genetic disorders. 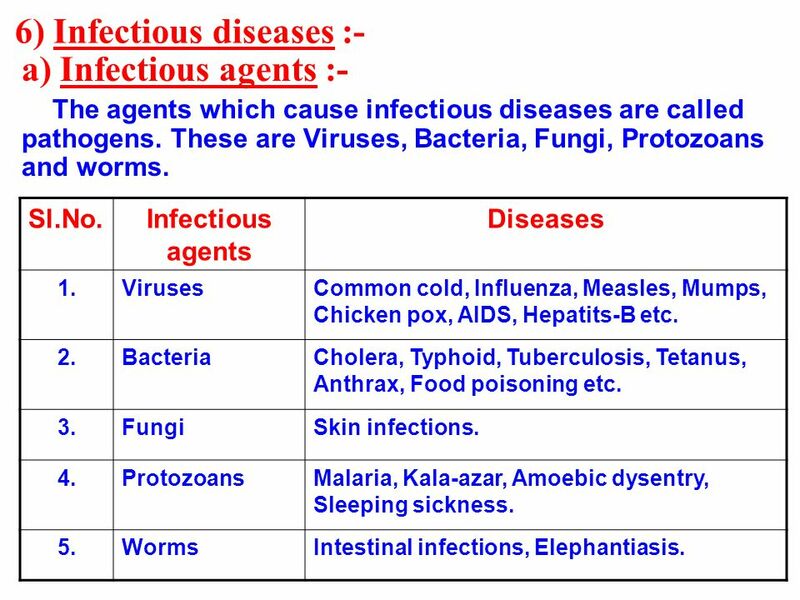 a) Infectious agents :- The agents which cause infectious diseases are called pathogens. These are Viruses, Bacteria, Fungi, Protozoans and worms. Sl.No. 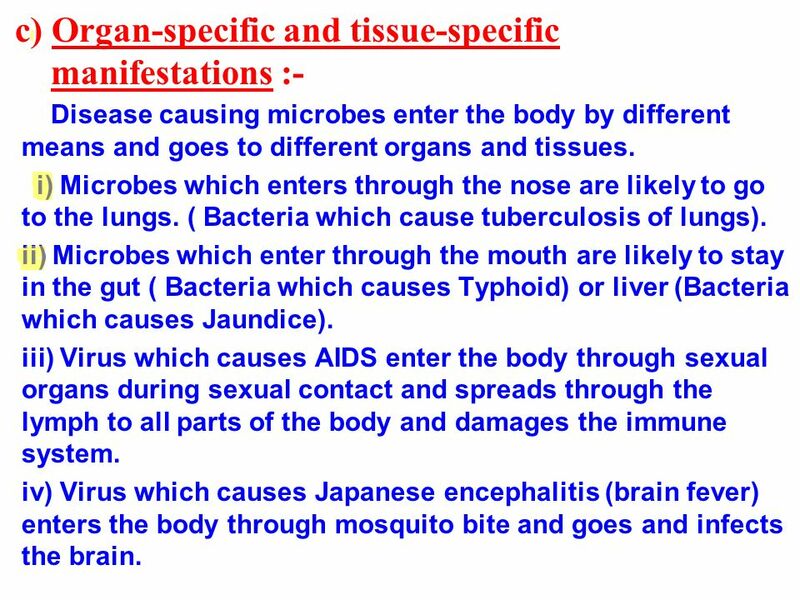 Infectious agents Diseases 1. Viruses Common cold, Influenza, Measles, Mumps, Chicken pox, AIDS, Hepatits-B etc. 2. Bacteria Cholera, Typhoid, Tuberculosis, Tetanus, Anthrax, Food poisoning etc. 3. Fungi Skin infections. 4. Protozoans Malaria, Kala-azar, Amoebic dysentry, Sleeping sickness. 5. Worms Intestinal infections, Elephantiasis. Infectious diseases spread from an infected person to a healthy person through air, water, food, vectors, physical contact and sexual contact. i) Through air :- Common cold, Tuberculosis, Pneumonia etc. ii) Through water :- Cholera, Amoebic dysentry etc. iii) Through vectors :- Mosquitoes :- Malaria, Dengue, Yellow fever etc. Flies :- Typhoid, Tuberculosis, Diarrhoea, Dysentry iv) Through sexual contact :- Syphilis, AIDS. AIDS virus can also spread though blood transfusion and from the mother to her child during pregnancy and through breast feeding. Disease causing microbes enter the body by different means and goes to different organs and tissues. i) Microbes which enters through the nose are likely to go to the lungs. ( Bacteria which cause tuberculosis of lungs). ii) Microbes which enter through the mouth are likely to stay in the gut ( Bacteria which causes Typhoid) or liver (Bacteria which causes Jaundice). iii) Virus which causes AIDS enter the body through sexual organs during sexual contact and spreads through the lymph to all parts of the body and damages the immune system. iv) Virus which causes Japanese encephalitis (brain fever) enters the body through mosquito bite and goes and infects the brain. 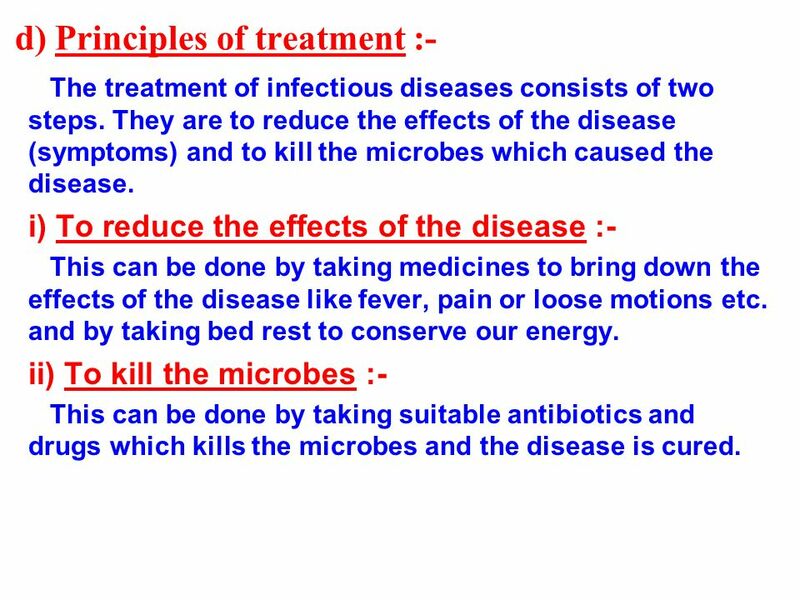 The treatment of infectious diseases consists of two steps. They are to reduce the effects of the disease (symptoms) and to kill the microbes which caused the disease. i) To reduce the effects of the disease :- This can be done by taking medicines to bring down the effects of the disease like fever, pain or loose motions etc. and by taking bed rest to conserve our energy. ii) To kill the microbes :- This can be done by taking suitable antibiotics and drugs which kills the microbes and the disease is cured. There are two ways of prevention of infectious diseases. They are general ways and specific ways. 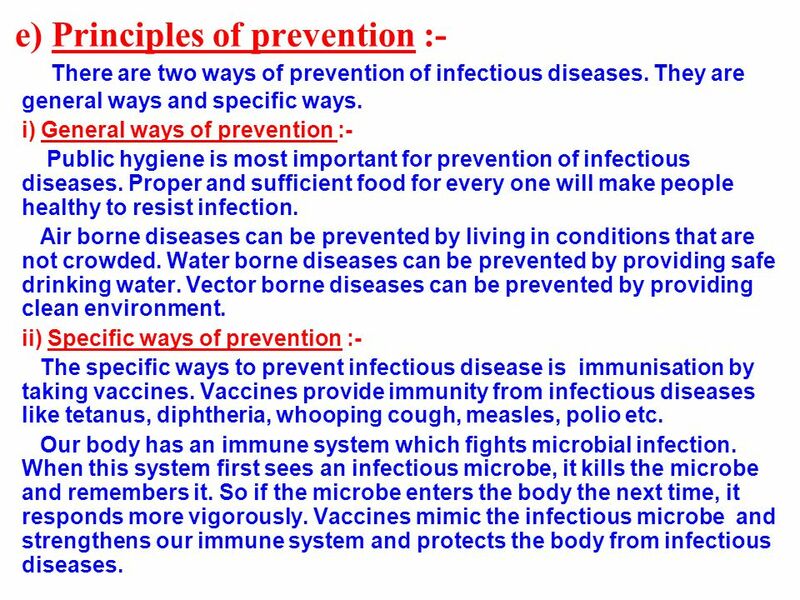 i) General ways of prevention :- Public hygiene is most important for prevention of infectious diseases. Proper and sufficient food for every one will make people healthy to resist infection. Air borne diseases can be prevented by living in conditions that are not crowded. Water borne diseases can be prevented by providing safe drinking water. Vector borne diseases can be prevented by providing clean environment. ii) Specific ways of prevention :- The specific ways to prevent infectious disease is immunisation by taking vaccines. Vaccines provide immunity from infectious diseases like tetanus, diphtheria, whooping cough, measles, polio etc. Our body has an immune system which fights microbial infection. When this system first sees an infectious microbe, it kills the microbe and remembers it. So if the microbe enters the body the next time, it responds more vigorously. Vaccines mimic the infectious microbe and strengthens our immune system and protects the body from infectious diseases. 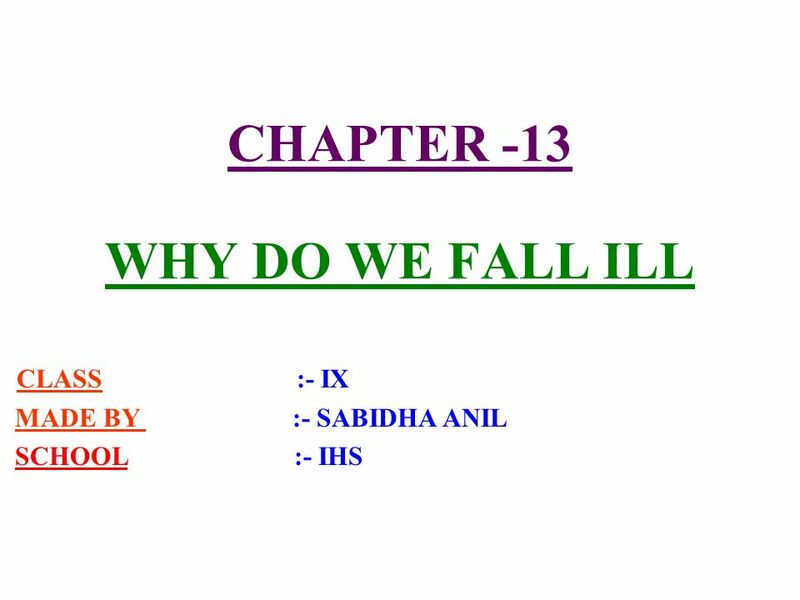 Download ppt "CHAPTER -13 WHY DO WE FALL ILL"
Quick write Notes ** What Causes Infectious Diseases? Mr. Ramos Health and Disease. 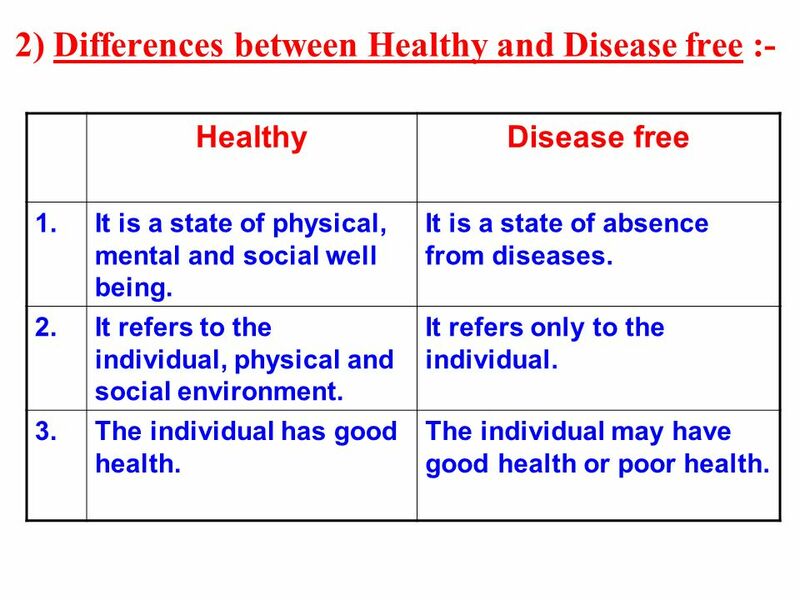 Introduction to Health & Diseases Health is the state of one’s body. 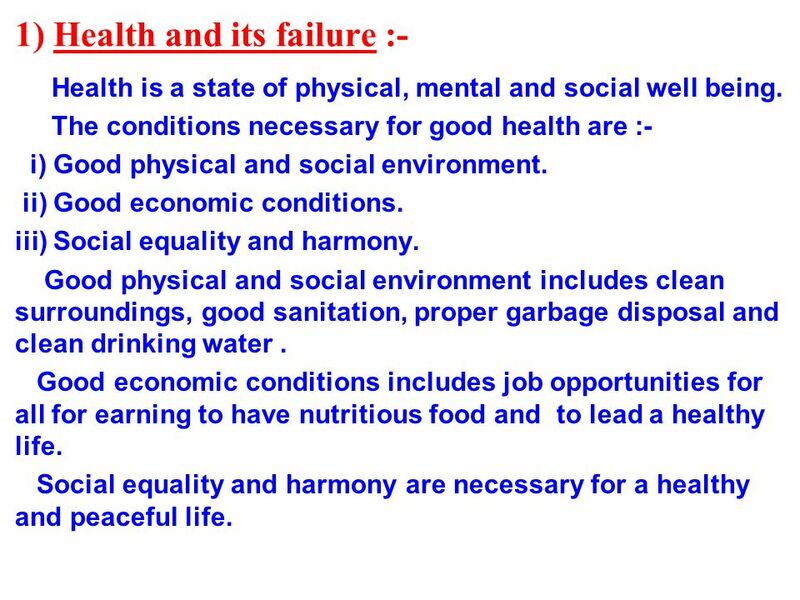 Good health and bad health Disease is anything that. Infectious Diseases. What Does Infectious Mean?  Infectious or Communicable Disease  Spread from one living thing to another or through the environment. Ch. 24 Sec. 1 Communicable Diseases. What are Communicable Diseases?  Any disease that is spread from one _______________ thing to another  Any disease. Lesson 3 Common Communicable Diseases When you have a cold, the best thing to do is rest, eat nutritious foods, and drink plenty of fluids such as water. Communicable/Infectious Diseases What are they and how are they spread? The Immune System The Body’s Defense. Viruses Bacteria and Your Health Ch I. How Infectious Diseases Spread A. Infectious diseases are illnesses that pass from one person to another. Psalams 139: Communicable Disease Is a disease that is spread from one living thing to another through the environment An organism that causes a.